“Leader of the Pack” is a series of articles recognizing Niles West athletes for their athletic, academic, and personal achievements. Nominations are accepted from coaches of both boys and girls teams each season. These athletes not only excel in their sports, but they also display leadership, good sportsmanship, and academic integrity. 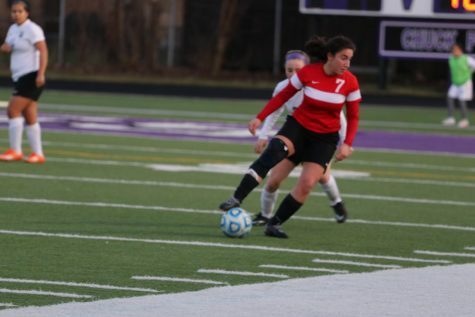 Nikoleta Baxevanakis (soccer): With one eye on the ball and one eye on the goal, senior soccer captain Nikoleta Baxevanakis dribbles the ball down the field, targeting the goal to score. She winds her leg back and fires the ball to see it hit the back net, a clean score. Baxevanakis is the leading scorer on the team, with seventeen goals and six assists. As the team captain, she leads by example and always does the most to make sure her teammates are all on the same page. Not only does she lead on the field, but she leads in the classroom, boasting an excellent 3.5 GPA. “I’ve always been there to push us through and get us a goal… I’m also actually going to play at North Park University. I love this sport too much to quit after high school,” Baxevanakis said. Alba Note expresses her thrill on her score on pole vault. Alba Note (track): The sun beats down on junior Alba Note as she stares down down the runway at the pole-vault pit. The bar is set at ten feet and six inches, but with the pole gripped in her hands, she knows she can clear it. She sprints down the runway and sticks the pole down, vaulting over ten feet in the air and landing in the pit. 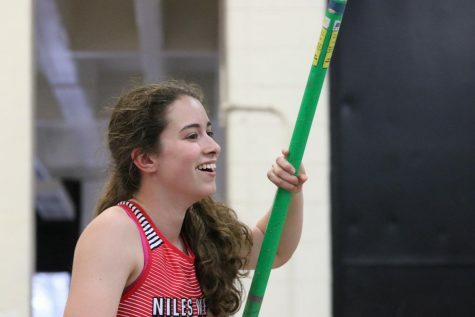 Note is one of the most successful pole-vaulters Niles West has had. 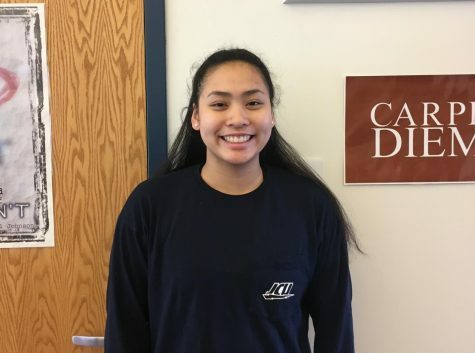 As a junior, she was named All-Conference in track and field, she is the Conference Champion for pole-vaulting, and she qualified for the state meet. 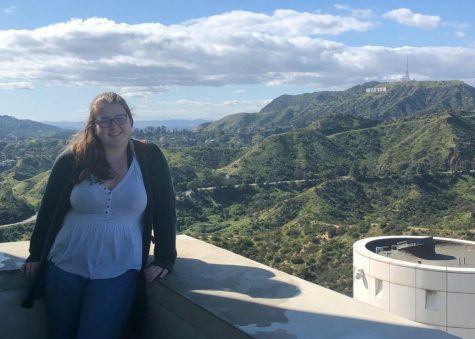 “Participating in athletics at West has greatly impacted me as a person because I’ve learned to overcome every challenge I face without fear, and I certainly wasn’t able to do that before. I’m really proud to say that I cleared 10’6” this season when state qualifying height is 10’3” and I hope to do better at state this week,” Note said. Healy posing for a picture in the hallway. Allena Healy (softball): Walking up to the batter’s box, senior Allena Healy gets prepared to face the opposing pitcher. She sets herself up as the pitcher winds up and throws a fastball right down the middle. Healy swings and cracks the ball straight down the middle of the field. Healy has been nothing short of impressive in her sport of softball. Her talents show just by looking at her stats, with an excellent .338 batting average, including five doubles, a triple, and a home run. Healy maintains a clean .933 fielding percentage. Head softball coach Christina Rosin loves the work Healy puts in and admires her leadership. “[Healy] brings experience and knowledge of the game, she leads by example and she works hard no matter the conditions. She is always working to improve her skills,” Rosin said. Avenir posing for a picture. Katelin Avenir (water polo): The pool is filled with aggressive, ready for action water polo players, all fighting for the ball to get a chance to shoot and score a goal. Senior Katelin Avenir is one of these girls. Being an excellent swimmer, she quickly approaches the ball and picks it up. Fighting off defenders, she finds a clear shot and fires the ball, scoring a goal for her team. Even though Avenir was out for some of the seasons with a concussion, she was second on the team for scoring and third on the team for steals. An amazing player in the pool, she is also top of her class with an amazing 4.04 weighted GPA. 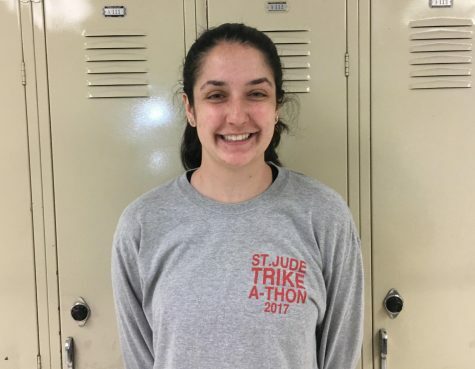 “Participating in athletics at Niles West has truly provided me with many lifelong skills that I will use as I continue on my athletic career in college, as well as, many valuable friendships and relationships with my coaches and teammates. 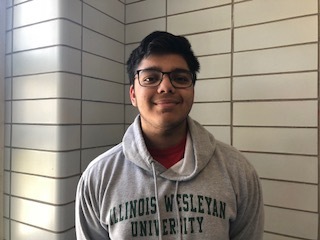 It has been an amazing opportunity to be able to be a part of these teams at Niles West,” Avenir said. The poll will close Sun., May 20 at 6:00 P.M. Click here to vote.